Say “fromage” | Run. Work. Live. Repeat. Unless you are Deena Kastor and possess no body fat, or you’re a French super model (say “fromage but don’t eat any”) and a freak of nature who even looks good when panting like a dog, great race shots are hopeless. Most runners I know agree with me, especially the women. It’s a shock to see what you actually look like versus how you think you appear when running. I can’t tell you the number of times I’ve spotted the course paparazzi and picked up my stride, hoping to imitate a human Secretariat only to find I resemble the donkey from Shrek barely trotting along. In most race photos I usually look as big as Alaska, or goofy with my mouth hanging open in a weird grimace, or like road kill being dragged across the finish line. I’m not saying this to be self-depreciating. It’s the truth. Other people over the years have seen my race proofs and agreed. There’s also the time my mother-in-law snapped a picture of me and my sister-in-law finishing a race together. She got the picture developed and when she showed it to us, she laughed until she snorted. “You guys like look something the cat dragged in,” she said. 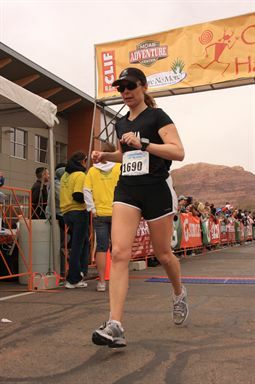 The camera gods smiled upon me at last weekend’s race, the Canyonlands Half Marathon in Moab. Check out the shot of me above. It only took 20 years of racing to get a picture of me running that I like — but, hey, who counting, right? No, it’s not a Runner’s World cover shot, but I gave up such aspirations long ago. Notice that both of my feet are moving and I don’t look like I’m on a death march. I’ll take that. Tomorrow I’ll run my last 20-miler before Boston. Then it’s taper time. Woo-hoo!! There’s only 24 days until Boston. Thanks to the Canyonlands Race, I now have a good visual to hold in my head and no more donkey from Shrek. Mileage yesterday: 9; Denver to Boston miles logged: 1495; Miles left to go: 275. This entry was posted in Humor on the go by Danica. Bookmark the permalink.